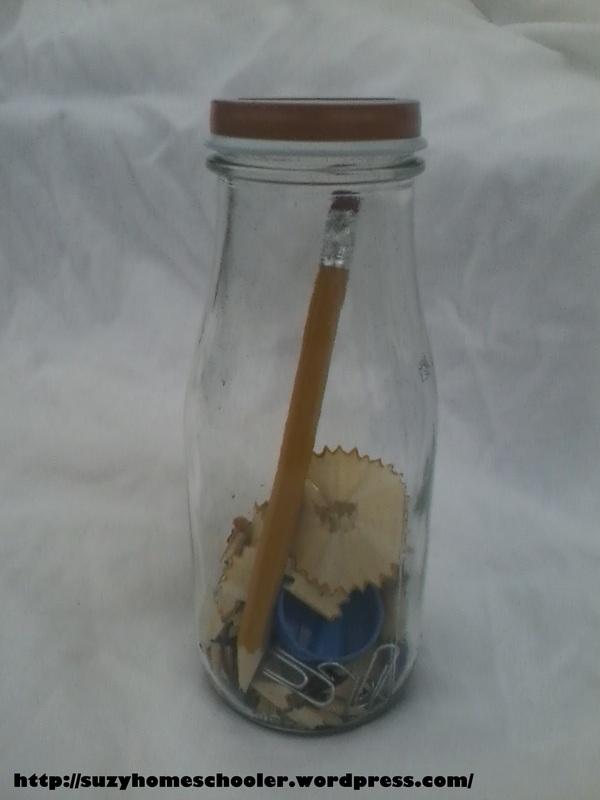 Pencil shavings, paper clips, pencil sharpeners, staples, erasers, and a pencil. All school supplies SunnyGirl tries to steal from LittleMan. Solar system. This was Marmaduke’s idea. All I did was go through our bead stash and gather round wooden beads about the right colors in 3 different sizes to resemble the planets. I added some details with colored Sharpie markers. Saturn’s rings are made with an orange pipe cleaner. 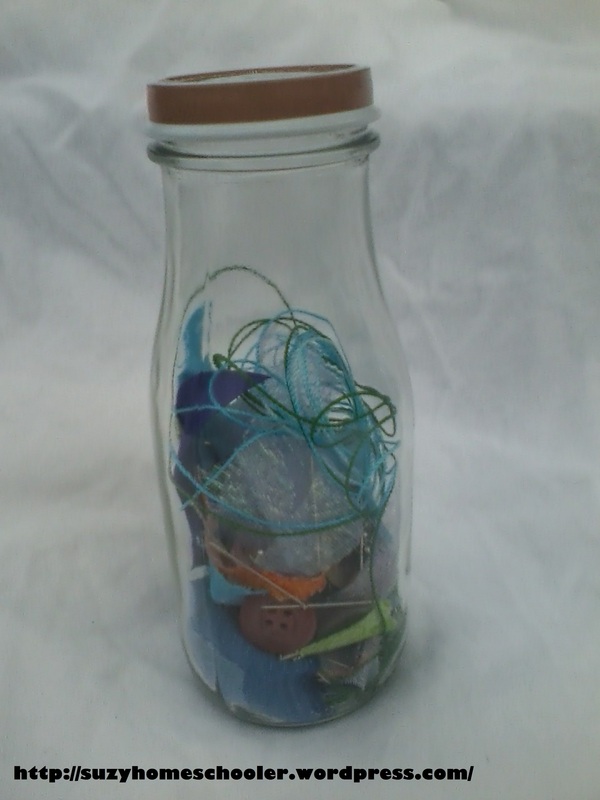 Then I strung all the planets onto a dark colored pipe cleaner and put them in the bottle. 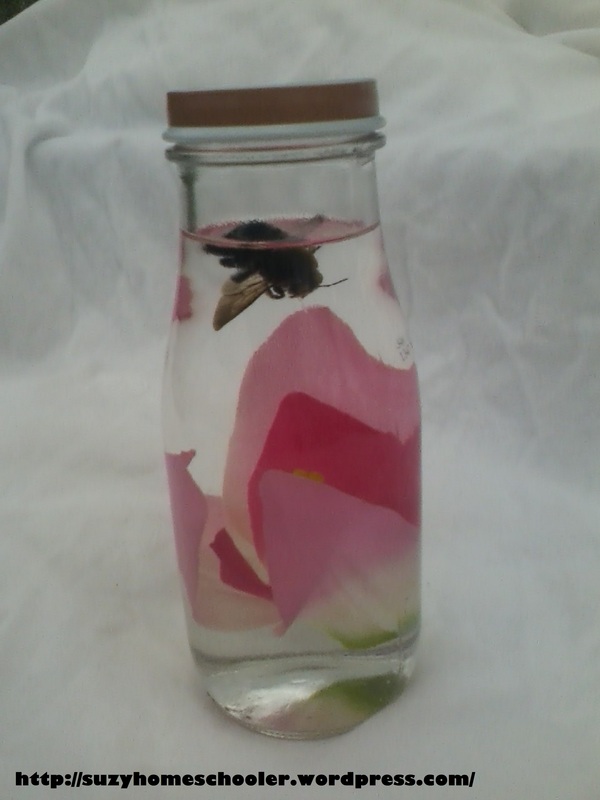 I filled the bottle with water and added a drop of black food dye. 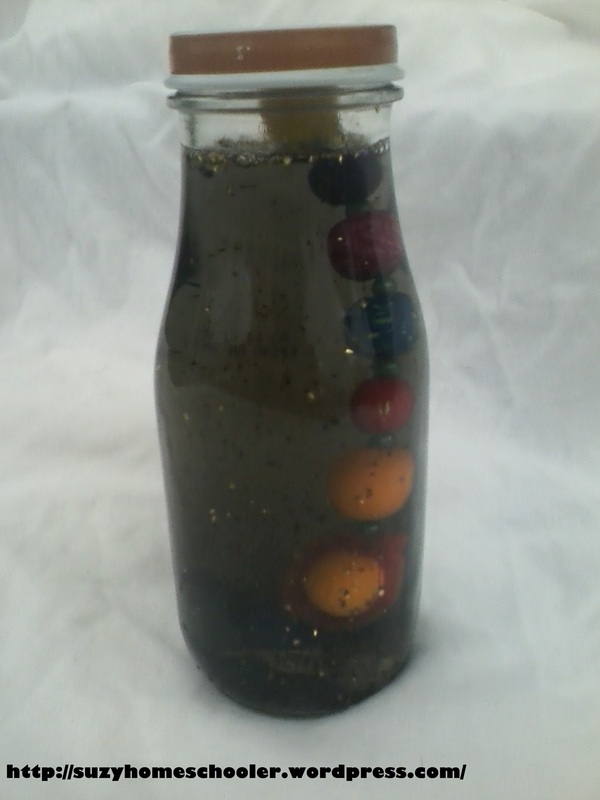 Just enough to make the water dark but not so dark we couldn’t see the planets inside. Then I added some glitter to act as stars. 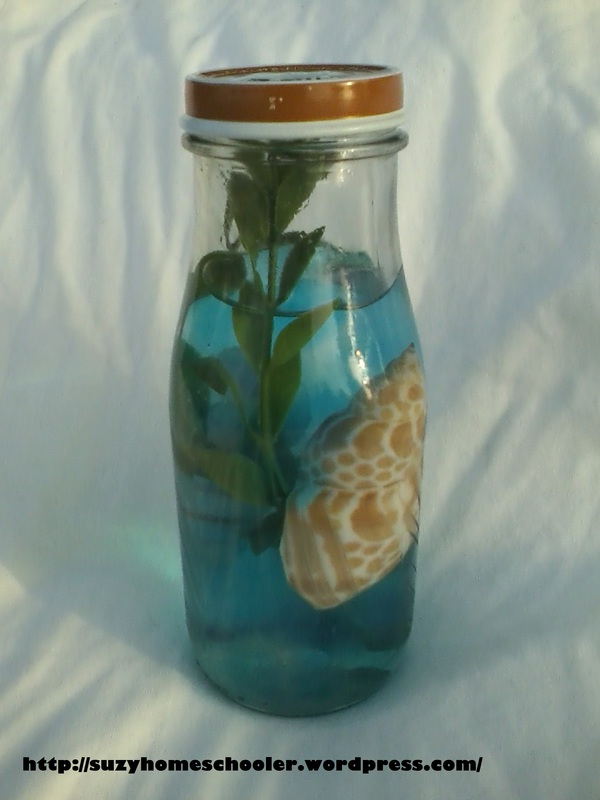 Blue water beads, water, plastic aquarium plant, and sea shells. 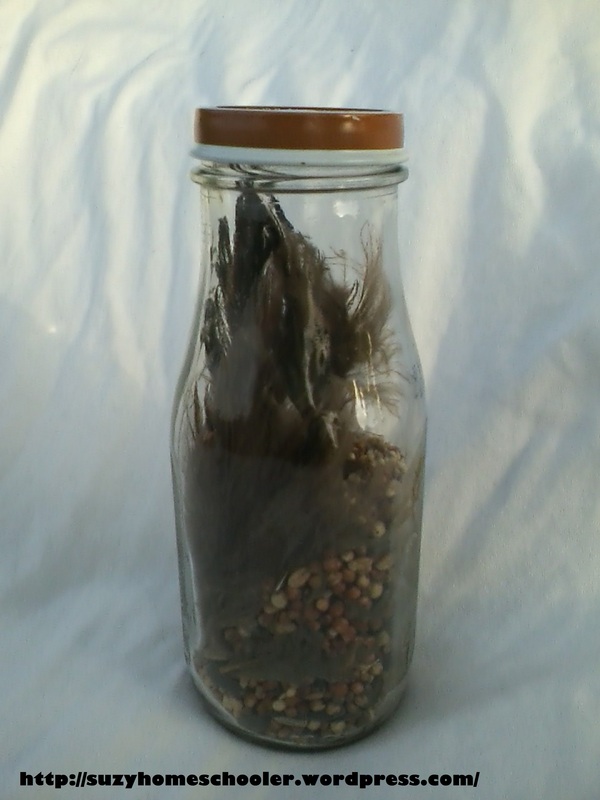 I call this the “how much is that doggie in the window” bottle, lol. 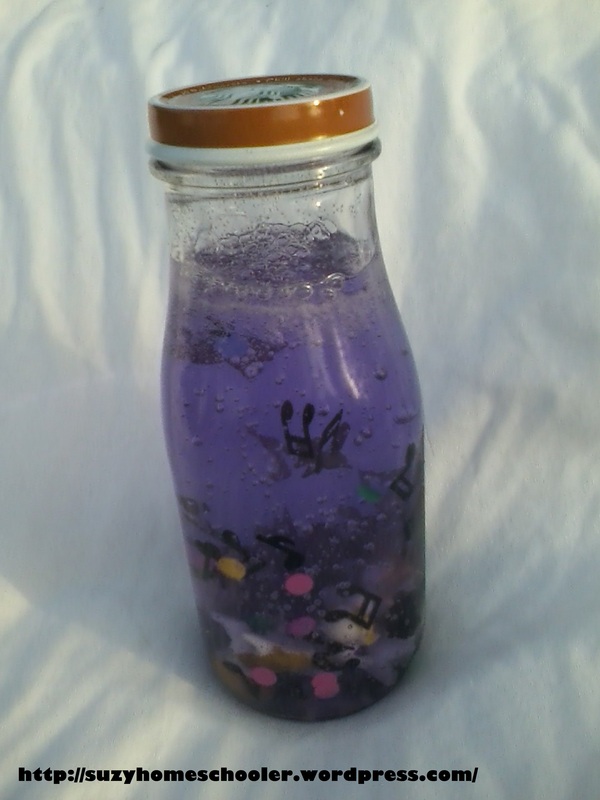 Its just purple dish soap, music note confetti, and a few plastic dog figurines from a quarter machine at the mall. The dish soap makes everything inside move very slowly, hard to capture on camera but it looks cool. Rice dyed green, flower and leaf confetti, and Squinkies figurines of Tinker Bell and some other fairies, woodland creatures, etc..
Straight pins, bits of string, ribbon, fabric scrap, buttons, and cotton stuffing. All sewing supplies SunnyGirl tries to steal from me, lol. Now for the fun part, the reason there was a call for discovery bottles on Facebook in the first place. Fun at Home with Kids compiled an album of everyone’s discovery bottles! 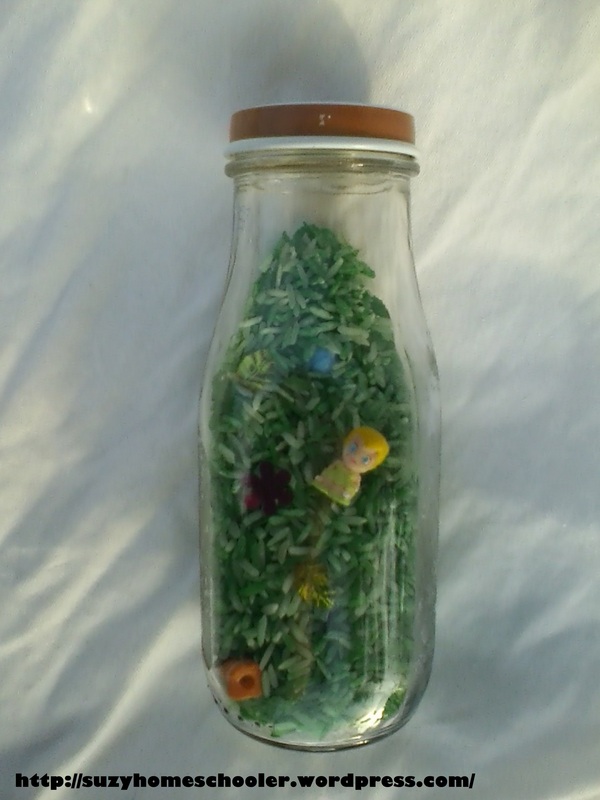 It is the ultimate list for discovery bottle inspiration, check it out on Fun at Home with Kids’ Facebook page.